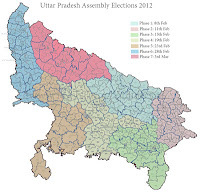 First phase of Assembly election in Uttar Pradesh will be held on Wednesday, while the campaign for the first phase of elections in 55 Assembly seats across 10 districts of Uttar Pradesh ended on Monday. Congress and BJP had announced not to support any political parties or group in view of the possibility of a hung assembly while the SP and BSP were confident of being in the race to grab the power. More than 2 lakh policemen, including 780 companies of Central forces, have been deployed for this phase of elections. "Campaigning for the first phase of elections, polling for which would be be held on February 8, ended this evening," additional chief electoral officer Mrityunjay Narain told reporters in Lucknow. He said that polling in 10 districts, including Sitapur, Barabanki, Faizabad, Ambedkar Nagar, Bahraich, Shravasti, Balrampur, Gonda, Siddharth Nagar and Basti would be held amidst tight security arrangements. In this phase more than 1.70 lakh electorates would seal the fate of 862 candidates in the fray for 55 seats.